New simulations confirm the theory that Jupiter was formed much farther away from the Sun. An article published in the journal “Astronomy & Astrophysics” reports the results of a research on the migration of the solar system’s gas planets and in particular on Jupiter’s movements. A team of researchers led by Simona Pirani, a graduate student in astronomy at the Swedish University of Lund, created a series of computer simulations to try to explain the asymmetry in Jupiter trojans, given that there are about are approximately 50 per cent more Trojans in front of Jupiter than behind it. The result is that such asymmetry may have occurred if Jupiter was formed at a distance from the Sun four times greater than its current one and then approached and attracted the asteroids asymmetrically. Jupiter trojans have been the subject of more and more precise studies thanks to instruments of increasing power and their asymmetry has become a mystery that until now had found no explanations. In recent years, their study ended up repeatedly intertwined with that of planetary migration, a topic that is raising more interest also thanks to the discovery of other star systems. Dr. David Nesvorny of the Southwest Research Institute (SwRI) led some of these researches including the one reported in September 2018 in the journal “Nature Astronomy” focused on two Jupiter trojans, Patroclus and Menoetius. Now Simona Pirani’s team published the results of a series of simulations that reproduce Jupiter’s formation and migration towards the Sun during which it attracted what have become its trojans. 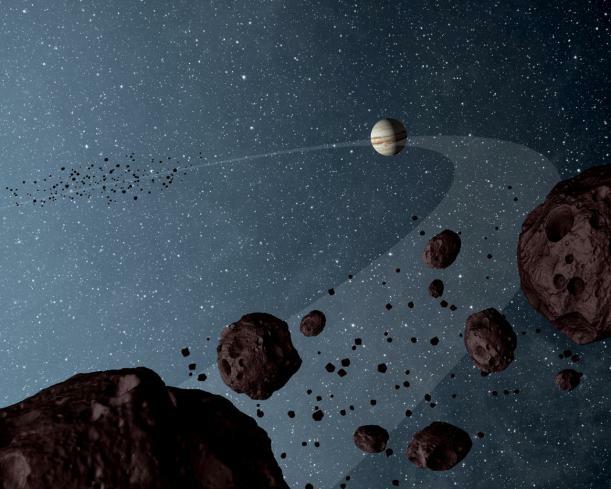 The asymmetry in the number of those asteroids is explained when the simulation starts with Jupiter’s formation at a distance from the Sun four times greater than its current one. In this scenario, between 2 and 3 million years after its formation, Jupiter started approaching the Sun, probably due to the result of the gravitational forces exerted by the surrounding gas present in the primordial solar system. During a journey that lasted about 700,000 years, Jupiter attracted thousands of asteroids bringing them with it as it approached the Sun. According to the researchers, the asymmetry is due to an excess of particles on one side of the orbit while Jupiter’s growth deformed those orbits with its migration and a consequent relative drift between Jupiter and the particles in the coorbital resonance. Put simply, there were complex gravitational interactions due to Jupiter’s growth and migration that influenced the smaller celestial bodies that were forming as well. Probably Jupiter trojans are similar to the building blocks that formed the planet’s core and were attracted to it since there was only its core, which in the following period also attracted the gas that turned it into the current gas giant. Anders Johansen, another of the authors of this research, stated that it’s possible to learn a lot about Jupiter’s core and formation by studying its trojans. Diego Turrini of the Italian National Institute of Astrophysics’ Space Astrophysics and Planetology Institute in Rome, another of the authors of this research, pointed out that these results are particularly interesting when compared with the images of circumstellar disks inhabited by young giant planets given to us by the ALMA radio telescope. That’s because astronomers are seeing gas giant planets in formation much farther away from their star than predicted by theoretical models. All this brings further confirmation also to the theory of hot Jupiters, gas giants very close to their star, which were formed much farther away and then got close. Jupiter trojans are useful for specific research on this planet but this research suggests that Saturn, Uranus and Neptune also formed at a much greater distance and then got closer to the Sun together with Jupiter. In essence, this type of research helps shed light on processes that are important in the evolution of star systems and the migration of gas giants can have important consequences, for example creating disturbances that prevented other asteroids from forming a planet, leaving an asteroid belt between Jupiter and Mars and stealing part of the materials in that area, a possible reason why Mars is much smaller than the Earth.